A Wildlife enthusiast does thing that thrills them. They love taking risk and setting new limit for themselves regardless of what time and place where they venture it. If this sounds like your persona then you must visit the best jungle canopy adventure tour in the world which is in Khao Kheow Open Zoo. Try things that you have never done in your life before and act that challenges your inner self while you experience the magnificent flight of the gibbon experience is simply mesmeric. In your visit of journey to the jungle rainforest is something which is must watch for everyone. It exhibits purest forms of nature. 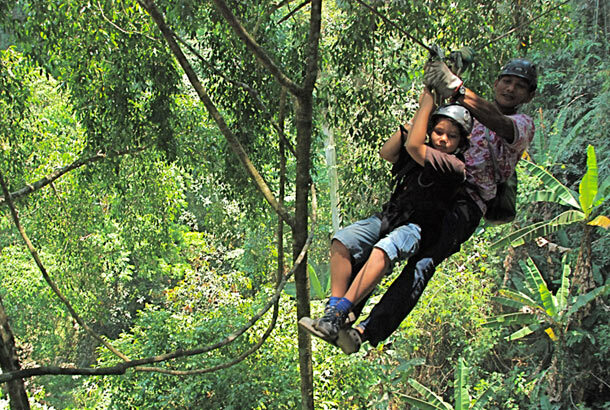 The magical Jungle canopy adventure tour offers adventurous moment that are thrilling and fun. Visitors are guided from the high tree tops of Pristine National Park. Visitors are glided through the jungle canopy via long and strong 3 kilometer wire. One could clearly sense the air and adrenaline rush of amazement when zip-line passes from one corner to another. 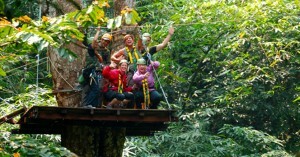 Jungle Canopy adventure tour of Khao Kheow Open Zoo is one of the biggest canopy in the world. Our experienced guide explains about charming beauty of such mesmeric sceneries and how it all started at the grass-root level. We suggest wearing long pants, polo T-shirt and sports shoes. Don’t wear excessive jewelry.